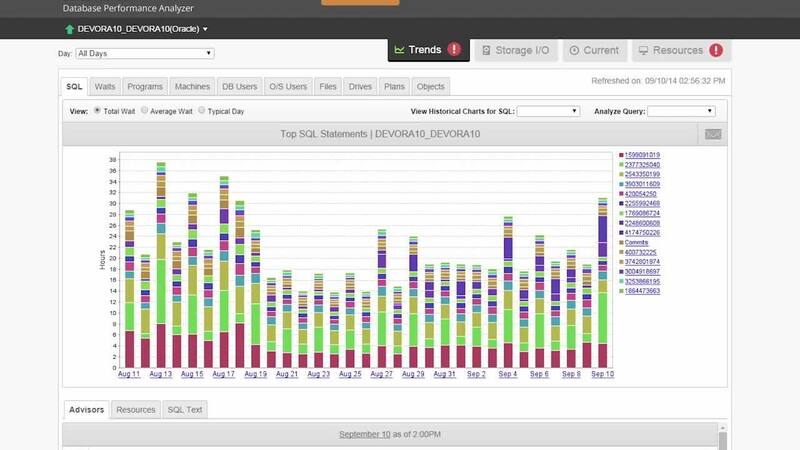 Discover why Oracle DBAs and developers love SolarWinds® Database Performance Analyzer (DPA). Designed to correlate activity, wait events, SQL statements, and other dimensions to help pinpoint the exact cause of Oracle database slowdowns. Get help knowing exactly what's happening in your Oracle database, including wait times, plans, queries, resources, changes, and historical analysis. Agentless architecture is safe to use in dev, test, and production, virtualized or in the cloud, Amazon AWS, EC2 , RDS, and Azure. DPA’s easy, web-based interface allows teams to collaborate and be on the same page about how new code impacts performance. Help ensure top performance for Oracle SE, EE, RAC, Exadata, E-Business and PDBs. Understand your Oracle performance with an at-a-glance picture across key dimensions, including SQL, Waits, Applications, Client Machines, Users, and more. Know your Oracle blocking hierarchy (who is blocking whom), as well as the overall impact to your database performance caused by blocking with comprehensive Oracle monitoring from DPA. Identify high-impact, inefficient PL/SQL—aggregated by tables—to find indexing opportunities. DPA’s database monitoring tool for Oracle helps provide an “X marks the spot” analysis of actual workload. Use an intelligent algorithm that gets better over time to understand your Oracle wait behavior so you can see and alert when patterns deviate from expected. SQL and plan analysis, as well as correlating query wait time with statistics, resource metrics, blocking data, and more. Tuning advisors can point to problems that need immediate focus. 24/7 Oracle monitoring can help answer why performance is or was bad, plus help you get a handle on where performance is headed and how your Oracle system is trending, including monitoring Oracle Exadata and Oracle SE performance. DPA web interface and read-only rights help make DPA safe to use across teams. Oracle developers can see the impact of code in production, and operations can see the impact of any changes. Built to provide comprehensive alerting and reporting that won’t overload your inbox. Plus, baselining can highlight outliers. DPA includes pre-built monitoring alerts and reports for Oracle, or you can create your own. Features Overview Discover why Oracle DBAs and developers love SolarWinds® Database Performance Analyzer (DPA). Database Performance Analyzer for Oracle is an industry favorite. Hands down. Less than 1%. We are agentless and only monitor active sessions allowing us to keep our overhead on monitored instances extremely low. Because we're agentless, we can monitor Oracle databases, SQL Server, MySQL, DB2, and SAP ASE running on premise (physical or on VMware) or in the cloud (both virtual machine offerings and Database-as-a-Service). What is Oracle performance tuning? Oracle performance tuning is the process of analyzing database and system metrics to identify bottlenecks to determine changes that will result in faster database performance.